By a 5-4 vote — five women against, four men for — the Seattle City Council Monday afternoon voted to reject ceding a portion of Occidental Avenue South to hedge-fund manager Chris Hansen so that he can construct his proposed half-billion-dollar basketball/hockey arena in Sodo. Without the street vacation, there is no way Hansen can proceed with his project. Council members Lisa Herbold, Kshama Sawant, Debora Juarez, Sally Bagshaw and Lorena González voted against giving up the street. Bruce Harrell, Rob Johnson, Mike O’Brien and Tim Burgess voted in favor. Councilwoman Gonzalez, who previously had not indicated her choice, cast the decisive no vote, saying she had a “profound and deep struggle” over whether to sell the street to Hansen. Vacating Occidental was viewed as the last major step that Hansen needed toward getting a master use permit and making his $490 million arena “shovel ready,” which might have helped him acquire an NBA team before a memorandum of understanding for the project with the city and King County expires in November, 2017. Had the vote gone Hansen’s way, the city would have received $18 million to $20 million from the developer in addition to a pedestrian overpass, a public park and additional sidewalk space. Now, Hansen’s plans to lure an NBA franchise to Seattle to replace the Sonics, who departed for Oklahoma City in 2008, appear to be largely scotched. The NBA has stated repeatedly that it has no plans to expand or relocate a franchise prior to the November, 2017 deadline. 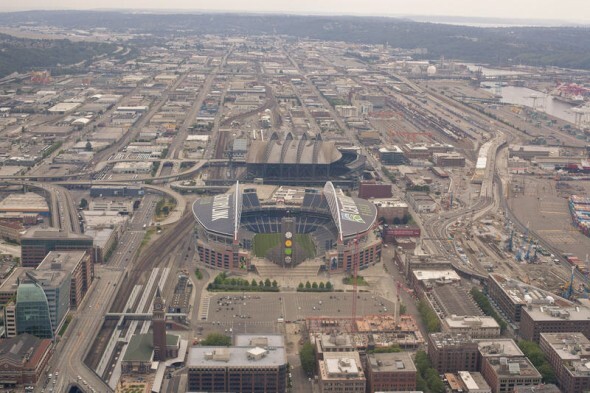 Hansen’s project has faced strong opposition from the Port of Seattle, the Seattle Mariners, The Seattle Times and many others, who have concerns about traffic and additional infringement on the maritime industrial area surrounding the stadium district. The Mariners received a vacation 20 years ago on another portion of Occidental Avenue in order for them to build Safeco Field, but Hansen and a legion of supporters couldn’t sway the Seattle City Council in their behalf. Had Hansen been successful, he and his investors could have received up to $200 million in municipal-bond funding for his facility, which was scheduled to be paid back from arena operations. That’s where any arena is going if one gets built. I’ve had enough of the “Seattle Process”. Gender Gap in Seattle politics? Perish the thought. Apparently the big mouth punks over at kjr offended the female section. One vote. One stinking vote! I doubt the female section listens to the big mouth punks on KJR. I don’t, either. There are only so many mortgage and erectile dysfunction ads I can handle in one lifetime. The proper siting for a basketball/hockey arena is Factoria. The customer base and two nearby freeways make the most logistical sense. Nice try Mr. Hansen. It looked like you had all of your ducks in a row. In general, any place on the east side. Seattle = Third class city. The vaunted “Seattle Process” is a joke and the NBA and NHL are right in doubting any arena talk until someone actually gets a MUP. There is a silver lining: at least now the NBA can’t use Seattle as leverage to extort tax dollars from other cities. So that’s good. Still it is disappointing. The M’s got their street vacation, and their public money (way more than what Hansen is asking) and now they’re saying, ‘nobody else can do what we did.’ as for the council, somehow I can’t see how the arena would disrupt port operations that much. maybe I’m wrong, but just looking at the photo at the top of the article, there are plenty of alternative roads and routes. couldn’t they just build an overpass or something? There aren’t any nba teams left that need to extort their cities for an arena in the near future, so this silver lining doesn’t really matter.